At this week’s international conference on Integrated Systems Research for Sustainable Intensification in Smallholder Agriculture, Aston Mulwafu presented a poster explaining on different feed options for smallholder dairy farmers to intensify their production systems in Malawi. Dairying in smallholder farming systems can be intensified to improve livelihoods. The biggest constraint faced by resource-constrained smallholder dairy farmers in Malawi is limited of high quality but cheap dairy feed. 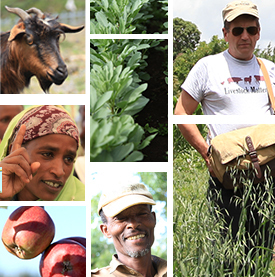 The use of high quality pasture grasses and protein-rich leaf meal from leguminous plants (trees and annual legumes) are a low-cost option that is increasingly being promoted in the region. A study was conducted among 100 smallholder dairy farmers practicing zero grazing to inventory feed sources currently fed to dairy cows and to identify niches that could potentially be used to increase feed and fodder production. We also determined the current milk yield as an indicator for feed quality and quantity. All farmers fed their cows on grass collected from dambo (wetlands) and on crop residues (mainly maize stovers and groundnut haulms) during the dry season. In some cases farmers traveled between 5-10 kilometres in search of dambo grass. Fifty-nine per cent of the farmers supplemented their feed resources with cultivated pastures such as Napier (46%) and Rhodes grass (13%), and 30 per cent with tree leaves of Gmelina arborea, Toona ciliata, Melia azedarach, and Sesbania sesban. Only 5 percent of dairy farmers utilized all feed sources. The cultivated pastures were grown along farm boundaries and as buffers between fields and dambos. Almost half of dairy farmers planted along contour bands. Seventy-five per cent of farmers were engaged in storage of crop residues for feed in quantities of 20 to 30 kilograms bales. However, stored feed was not adequate to meet recommended numbers of 300 bales for one cow per year. Average milk produced was 14 litres per day per cow with a range of 4 to 35 compared to potential of 40 litres. We conclude that the quality of feed sources (dambo grass, maize stover and some of the tree leaves) fed to dairy cows is largely of low quality and therefore affects milk yields. Better quality forages and fodder trees could still be grown in the available spaces within farms. Tags: africa rising, CGIAR_Systems. Bookmark the permalink.